Smack That (a conversation) spoke volumes last night at Ovalhouse – addressing the serious matter of domestic abuse and sharing honest accounts through party games, audience interaction and dynamic choreography. A close cast of six women, a mixture of non-performers and experienced dancers – all having experienced domestic abuse – welcomed us, the audience, in to Beverly’s party. They were all wearing the same sparkly dress and had the same silver hair; it was obvious they were all Beverly, and as I was passed a name sticker with ‘Tree Bev’ on it (because I had a tree of life necklace on) I realised we were all Beverly too. This persona (a similar setup to the play Abigail’s Party by Mike Leigh) was used to narrate a collection of real life experiences through several methods – choral speaking, energetic movement sequences, and individual monologues (to name a few!). Rhiannon Faith, the creator of this powerful piece of theatre, has not only directed captivating and emotional material but she has also simultaneously created a safe space for the audience to wordlessly share their own experiences if they wanted to. This was accomplished through the use of well known party games such as ‘What would you rather…’ with an effective arms up or down method, and ‘Never have I ever’ (a interactive game in which you stand if you have done/experienced what is being said) which started off as “Never have I ever been sick at a party”, for which over half the audience stood up. Then, as the audience became more confident, the statements gradually became more personal; for instance; “Never have I ever been humiliated in front of people I care about” and “Never have I ever had a knife held to my throat.” With this change the atmosphere was tense and emotional as people around the theatre stood. There are a number of measures in place for the audience’s well-being, for example: a chill out area for anyone needing a break from the show for personal reasons; a qualified therapist at the ready; information available about receiving help from services such as Woman Said. This is one of the first performances I have watched where the audience members are supported and cared for in such a humane and positive way, and this of course provides a comfort to those who did find themselves opening up throughout the performance. Stories told verbally and stories that were embodied were equally as moving and raw, and all performers had their own strengths and weaknesses. Some slightly improvised transitions between games, interactions and dances were slightly lacking momentum but this is likely to improve further into the run. Overall the group was clearly connected and acted as a true ensemble. However, one cast member in particular – Valerie Ebuwa – deserves a mention, as she blew me away by being extremely talented both vocally and physically. You can see the time, research and care gone into this project and its outcome is a shockingly emotional, yet powerfully factual one. Rhiannon Faith has opened the audience’s eyes wide as well as their hearts – this dance theatre piece is like no other, and certainly not to be missed. Cacophony is a new play from upcoming writer Molly Taylor. Set in modern Britain, it tells the story of a group of young people whose lives are rocked by a tragic incident at a protest. In its aftermath, central figure Abbie (played by Annie Hawkins) pens a moving blog post about her experience at the protest, and is unexpectedly catapulted into the spotlight as a prominent feminist activist. Articulate, passionate, intelligent, and pretty, she becomes a Twitter celebrity in short order, finding herself featured on talk show panels and invited to speak at conferences. However, Abbie has a secret that she’s not telling, and it threatens to bring her tumbling down from her new heights of fame, with disastrous consequences. There is a phenomenal energy to this production, thanks to the powerhouse cast of 17 young actors who play their (often multiple) roles with precision and punch. The story is told as conceptualised flashbacks, a desperate investigation into the past to find how events led to the cliffhanger on which the play ends. I always appreciate theatre with ambiguous endings, and it is especially effective here. Taylor’s writing is witty and razor-sharp, crackling with humour and social commentary. Michael Bryher has achieved the feat of directing a large cast on a minimalist stage in such a way that it never feels crowded or sloppy – the movement of myriad characters around and over the space is done with exactitude and grace, and the audience’s attention is always focused just where it is supposed to be. Cacophony hums with tension throughout its 80 minutes. Sound, lighting, and visual effects complement and enhance the drama without ever distracting from it. And, again, I must come back to the superb performances from the entire cast, who bring these characters to messy, beautiful, flawed, and vibrant life. As is often the case with my reviews, my only criticisms here are more about the social politics of the writing rather than the staging of this production. Although there is a powerful scene in which one of Abbie’s (black) friends points out that Abbie is riding on fame only available to her due to her image as a pretty, young, educated white girl, this doesn’t change the fact that this is a story in which a white girl is placed front and centre while her black friends orbit her – often incapacitated, unwilling to speak, or awed by her. Abbie is a complex, flawed character and this is wonderful, but the final monologue from her (also black) best friend seems to whitewash all her sins and paint her as the character for whom we should have the most admiration and sympathy in this story, despite the fact that… it’s not her, but a black character who is almost killed for her beliefs, and then sidelined for most of the play. Feminist art is almost always dominated by the stories of white women, and this phenomenon is almost painfully obvious in Cacophony. That said, this is an awesomely slick, hard-hitting piece of theatre with a lot to say. I am reminded in story and themes of Feed by Theatre Témoin @ Pleasance Dome, which I reviewed during last year’s Edinburgh Fringe – the subject of online activism and the meteoric rises and falls of its darlings is certainly very topical, as is that of the effects of social media on identity and mental health. I hope this production and cast has more performances still to come, and would highly recommend Cacophony to anyone who wants to see some excellent theatre. Relative newcomer to London that I am, I had never been to Highgate in North London before this evening. I didn’t expect, on exiting the tube station, to enter such a beautifully leafy, quiet, almost quaint community! The Jacksons Lane Art Centre is located in a former Methodist church, built in the Gothic style, and the decor inside mixes cosy charm with old church pews. On settling down in the theatre to watch the show (and I think I was about the only adult without a small child in tow), I began to suspect that this was going to be old-style family fun circus, matching its venue. I was right: Hotel Paradiso was exactly the mix of acrobatics, slapstick clowning, pantomime, and melodrama which has been entertaining families for centuries. The plot – about the ragtag staff of a once noble hotel, banding together to fight the evil Banker – was absolutely paint-by-numbers, often made very little sense (as acknowledged by its narrator), and mainly existed as a framing device around the various circus acts. These acts included a fair amount of tightly choreographed group acrobatics, as well as aerial performance, juggling, balancing, and hula hoop work. Three of the six performers tended to be the ones doing most of the show’s acts, with the other three seeming underutilised in supporting roles. One performer in particular seemed to be having a rough night, with a fair few fumbles and trips, though these were carried well in-character with an oafish “oops” and goofy grin. Although the three male performers in Hotel Paradiso did bear the responsibility for all the acrobatic base work, it was really the women who carried this show. Natasha Rushbrooke as chambermaid Talia was elfinly lovely in all her acts, and I found myself especially on tenterhooks watching her twist her limbs into impossible positions as she balanced on a precarious stack of chairs. Her character had virtually no lines, and existed as very little beyond a wide-eyed, beautiful, coquettish young girl, but she played this role with as much sweetness and humour as possible. The character of her mother – the Madame of the hotel – was played by Annabel Carberry, a company director at Lost in Translation. Carberry’s hula hooping skit (featuring more hoops than is compatible with drinking a glass of wine) was definitely the main highlight of the show, combining finely-tuned acrobatic skill with excellent comedy. Some light googling on my way home on the tube revealed that this routine is a staple of Carberry’s, usually performed as a solo act called “A Glass of Red”. It had been lifted wholesale, inserted into Hotel Paradiso, and tweaked slightly to be more or less plot-adjacent… and I loved it! However, other than in these two women’s acts, the rest of the show did have a tendency to drag and feel repetitive. I am the least flexible and coordinated person I know, so it feels a bit rich to judge these performers, but I’ve seen a lot of excellent circus in the past year and this company couldn’t really compete. That said, this show wasn’t really for the circus connoisseur – it was for the children in the crowd, who I often observed at the edge of their seat, gaze transfixed, mouth agape, sometimes letting slip loud gasps or exclamations of “she’s going to fall! !” Anything that can keep the enraptured attention of an audience full of four-year-olds must have some spark of magic to it, and so on consideration, I think Hotel Paradiso can best be described as an excellent alternative to the cinema or local playground for anyone with small children. The Cage theatre at the Vault festival is a dank and dingy cellar space, where trains rattle overhead at regular intervals and the air is surprisingly hot and muggy for such a subterranean place. It’s somewhere you could imagine stumbling across long-forgotten dead bodies, but that’s about as close as it comes to being funeral-adjacent, let alone a location for a wake party whose subject is still very much alive. And yet, Fine Mess Theatre manage to live up to their name, and transform the Cage into a space for pathos, humour, joy, and a shindig which leaves it strewn with party hats and, brightly coloured decorations, and empty plastic cups of prosecco. At just over 45 minutes long, A Wake in Progress is both short and (bitter)sweet. It tells the story of a young person diagnosed with a terminal illness, and how they and the people closest to them come to terms with the fact that their time left with them is limited. The five actors play various roles from the protagonist’s life, including lover, sibling, best friend, and funerary celebrant/amateur therapist/narrator (who, played by Stella Taylor, was the standout talent in a talented cast). The audience plays a role in decision-making at several junctures, from naming new characters as they’re introduced, to deciding whether our story’s protagonist decides to buy a dog or go skydiving. On the night I was there I didn’t feel like the cast did the best job of incorporating the audience suggestions in any way deeper than the odd throwaway line, but this was still enough to instill in the audience a sense that we were part of events. As a result, towards the end (when the titular wake takes place), it felt relatively natural for us to play the role of assorted family and friends – assisting to hand out party hats, pour drinks, pass around sweets, and generally get up and moving and schmoozing. The resultant atmosphere really did feel like a somewhat awkward but overall pleasant soiree – just as it was supposed to be. After all the characters had finished their speeches, we came together to sing In My Life to ukulele accompaniment, sharing pre-printed lyric sheets with the person next to us. With my eyes on the paper in front of me, and my whole concentration on trying to sing along, I didn’t notice a subtle change taking place on stage; when I looked up and noticed what was different, it really did hit me in the guts. This final moment – of loss mingling with a feeling of community and connectedness – was the one which best encapsulated what grief truly feels like, and it stayed with me as I left the theatre. A Wake in Progress is nicely done little play about life, death, and relationships; yet despite these heavy themes, it manages to stay light and warm-hearted. It is hardly an ambitious project, but with it the artistic team at Fine Mess has achieved a playful, earnest, and amusing piece of theatre which fits snugly with the feeling of the Vault festival. In the aftermath of Anne Rice, True Blood and Twilight it’s easy to forget the original bloodsucker to make us fear the dark, but Creation Theatre’s production Dracula is here to remind us in an evocative fashion. The twist here is that Dracula takes place in the London Library, amongst the very books that, over a century ago, Bram Stoker used to research his seminal work of vampiric fiction. This is a fact only recently discovered by the library itself, a charming institution that seems itself torn from the pages of a romantic Victorian novel. Creation Theatre is no stranger to site-specific productions, and has been staging them for over two decades, including last year’s original run of Dracula in Blackwell’s Bookshop, Oxford. The play itself is a two-hander starring Sophie Greenham and Bart Lambert as Mina and Jonathan Harker, as well as several other secondary characters. In the aftermath of Jonathan’s encounter with Dracula on the continent and the death of Mina’s friend Lucy, we meet the Harkers as they grapple with grief, a new and flawed marriage, and a growing darkness neither of them wishes to address. Though still firmly Victorian in themes and1950s in setting, Creation Theatre’s production makes great strides in adapting Stoker’s text for the twenty-first century, making it more palatable for a contemporary audience than the at times stilted pace and style of the original (I confess I have tried but never succeeded in reading the book myself). Greenham and Lambert juggle their multiple characters well, but I often found myself longing for them to return to the central imperilled couple, where their chemistry was most keenly felt, rather than lingering on the secondary characters as the script did for large parts of the second act. And speaking of the second act, the text itself is somewhat bloated, and saw me wishing it has been edited to a tight seventy-five minutes rather than the two hours with interval it stretched for. As always with horror, whether on screen or stage, the monster is best when left unseen, and in the case of a figure as well known as Dracula, he can work his dark magic best when even left unmentioned. The strongest parts of the play were when the Count’s influence was felt but never mentioned, and despite cunning and eerie use of projected special effects and soundscapes, the monsters were always at their worst when they were at their most palpable. The audio and visual design by Matt Eaton and Eva Auster respectively was mostly excellent and evocative, with the notable exception of a particularly egregious animated bat that looked straight out of Microsoft Word clipart circa 1998. For a piece of site-specific horror theatre in as apt a site as you are likely to find, fans of all things vampiric are advised to catch Dracula at the London Library while they still can, as the season is expected to sell out. Not everyone is a fan of boxing – the sweet science is not as sportsmanlike as some other popular sports, not as theatrical as some of the other martial arts. I love boxing – I think it’s like extremely literal chess – but I understand the criticisms levelled against it. Many fighters are injured, some in life altering ways, there’s a lot of corruption, a lot of unsavoury personalities. I find it beautiful because, not in spite, of these flaws – and they’re all on display in this ninety minute show. Exit Productions have made an ambitious, immersive show that takes you through all the stages of the eponymous night – we see the weigh in, go into the locker rooms, hear the pep talks, cruise the merch table, chat to the bookies and officials – and our contributions impact the outcome of the fight, which is thrilling and beautifully staged. Dev J. Danzig’s set design uses the curious, stony space of the Vaults well – from the luxurious ringside VIP section to the dodgy blackjack table to the cramped lockers, the place feels authentically like an underground boxing show. The cast immediately establish themselves as clear, distinctive characters, all with motivations, secrets and means. The whole audience can get as involved as they like – some people are picked to have specific roles, such as medical assistant or valet, but we all get stacks of chips with which to bet, bribe or purchase merchandise. The actors were engaged and engaging – I spent a lot of time with a slimy promoter, an indebted doctor and an impassioned trainer, who each gave me information and opportunities to alter the outcome of the fight. We discussed head injuries, performance enhancing drugs, female boxers and risking your life for the chance of a pay off. As a judge, chosen on the basis of literally nothing, I then got to sit down and call the outcome of each round – though I and the other judges had been bribed to ensure a certain outcome. Every audience member might have a particular favourite fighter they want to win – both the insecure loud mouth show-boater Joe Williams and the polite professional with a temper Bam Bam Bradshaw were very likable, though they hated each other. What makes the show so fascinating it that it’s impossible to tell who will be victorious until the final bell. And what does it mean to be victorious? Is it better to take a second round fall, survive to live another day or to fight through the pain and likely concussion? No two punters will have the same experience and no two performances will be the same. In that way, it is exactly like a boxing match. Like real boxing, I loved it, but I know it may not be for everyone. If you prefer a theatre experience that lets you sit down and not make any choices, Exit Productions probably isn’t for you. If you like to get involved and do some exploring, if you enjoy some uncertainty and anticipation, this is the perfect show. With immersive staging, modern language and a lot of flash, this Romeo and Juliet is well targeted to primary school children. It’s a great introduction to the narrative at exactly the age when students are starting to study it. China Plate’s production of the classic text places the Friar center stage, as a narrator and Greek chorus, explaining to the audience the tragedy as it unfolds. While the dialogue remains Shakespeare’s original, it’s been streamlined to just the key plot points and characters – Mercutio and Benvolio have been rolled together, Juliet’s parents reduced to hectoring projections, and the Friar has the Prince’s lines. All this has been done to make the play accessible to children from the age of nine – and they made up most of the audience. The immersive staging puts all the action on a cracked street, and the use of concealed knives as weapons makes the modern relevance of the story particularly clear. The sound and lighting design use the space extremely well, with a few live original pieces performed by our Juliet. The cast are largely competent, with the Friar and Tybalt as standout stars, bringing deeply felt emotion and complexity to their roles. This is a good production for children to experience both a classic Shakespearean tragedy and theatre for the first time. Welcome to the UK is a carnival comedy with a heart of gold. Created and performed by PSYCHEdelight – a company dedicated to giving asylum seekers a voice – whom are well known for their successful 2016 satire comedy Borderline. Welcome to the UK is the next chapter after Borderline, with a cast from 13 different countries all sharing moments of their personal journey through epic theatre techniques. The fun circus style and patriotic set design of union jack coloured bunting and flags gave us a warm welcome as we entered the space. Opening with burst from the energetic compère, played by Reuben Williams, we are immediately asked to think of a dream and blow it into the balloon left on our seats. After direction we all threw our airy dreams (pardon the pun) onto the stage… only to realise the balloons were for the rifle range at this warped carnival and it was perhaps not going to be all fun and games after all. The next 70 minutes was a whirlwind of fun fair activities masking the challenges refugees face when trying to claim asylum and build a future in the UK; menacing pigs in the haunted house portraying the fear in an arranged marriage, a home office interview displayed as a series of ridiculous questions from a mystical gypsy, a refugee’s struggle to meet tight deadlines reworked as a UV video game. Each scene was imaginative and comedy fuelled, however the show lacked slick transitions and the energy on stage regularly fluctuated. Aesthetically the piece was very strong; the diverse ensemble using physical storytelling (such as a literal emotional roller-coaster, which certainly made me giggle), the bright (and sometimes sparkling) costumes, and most of all the intricate lighting design which was effectively utilised to change the atmosphere throughout. The hostile environment created for the asylum seekers was a reflection of the UK’s decisions and policies, and this was clearly conveyed. There is no denying the importance of the show and the extremely current issues surrounding the topic. Watching the talented asylum seekers perform with such enthusiasm (particularly Mohand Hasb Alrsol Badr, who made me chuckle constantly) and listening to their experiences in a way that we can all learn and laugh was brilliant. PSYCHEdelight has again produced a platform for expression, and whilst making us giggle they provoke us to think, to consider, to empathise. During this wacky performance there was one particularly powerful and unsettling image; Abdulrahman Salama (a Syrian refugee) sat alone on the top of a ladder throughout with a single orange balloon, holding his phone and waiting in distress for news of his family. A constant reminder of the harsh reality between the laughs. 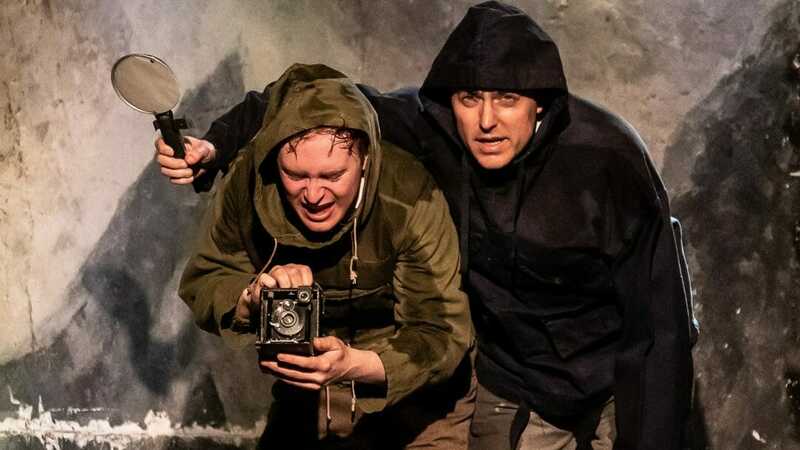 In this intimate production of David Greig’s 2002 play, we are transported to a world of harsh weather, barren horizons, naive hope, and seething ideological tensions. John and Robert are two young ornithologists, selected by the Ministry for an opportunity they would only have dreamt about: to spend one month in a remote island in the Outer Hebrides, observing the nesting habits of rare birds which remain obscure in scientific journals. Alone in this harsh environment with only an old Scottish shepherd of difficult temperament and his sheltered niece, the young men discover that all is not as it seems with the island, their mission, the birds, their neighbours, or even each other. At two hours and fifteen minutes (including interval), I’m pretty sure Outlying Islands is the longest piece I’ve seen in a London pub theatre. The story simmers along on low heat, with events taking a while to come to the boil – but when they do, and tensions bubble over, the plot’s twists and turns take the audience by surprise (or me, anyway). Most of the action takes place in a central stage space which serves as the abandoned “pagan chapel” where John and Robert are camping out for their stay, and this cramped stage and audience space excellently conducts the feelings of claustrophia and cabin fever which the boys begin to develop. We only witness the outside world in a corner of the theatre, which in my memory is full of flitting bird shapes and driving wind, even though these were evoked only through Christopher Preece’s wonderful sound design. The four main characters in this play are all very distinctive personalities, with two actors in particular standing out for their chemistry and comedic abilities: Rose Wardlaw as Ellen and Jack McMillan as John. In a story with an excess of navel-gazing, faux-edgy philosophising, and lulls, their interactions were some of the times when I found myself most captivated. Others included the snippets bordering on magical realism, such as an almost bacchanalian “pagan hymn” performed at a funeral, and the dreamy rapture of Ellen recounting an act of life-changing voyeurism. It was at these points that Jessica Lazar’s directorial touch shone through most clearly, as well as the neat work of movement director Jennifer Fletcher. It is clear that a number of talented creatives have worked on this production, as we have come to expect from the team at Atticist. However, Outlying Islands is ultimately let down by its script, which gets bogged down in dialogue often reminiscent of a first-year philosophy student’s self-important extemporising on matters of self and society. That said, this didn’t irk my companion as much as it did me, (“possibly because I’m a pretentious white male myself” – his words! ), and if that doesn’t sound like a deal-breaker for you, then I would absolutely recommend taking yourself to Islington to catch this eloquently staged production before it flies away.